Transiting through Frankfurt airport with 7 hours or more between flights? Reserve a Layover / Stop-over Tour with Frankfurt on Foot, and enjoy an interesting, memorable visit to Frankfurt. We take care of the details, so you don't have to. 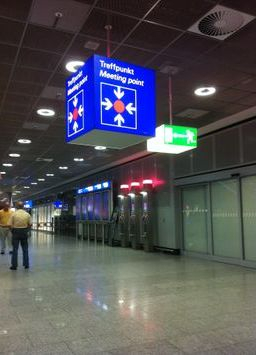 We usually meet our guests at the Meeting Point in whichever terminal they arrive in, since there is only one Meeting Point in each terminal. In Terminal 1 it is by Arrival Gate B-1. In Terminal 2, it is in front of Arrival Gate E.
If you have carry ons, there is a luggage storage facility near both of the Meeting Points and we can assist you in getting your bags stored as well as finding an ATM if you need euro. Make sure you have notified your bank that you are traveling in Germany so that your ATM card will work here. We do not recommend using the money exchanges. Once we confirm that we can offer you a tour on the date and time of your choice, we will request a 35 € deposit using PayPal. On the day of the tour, you would pay the guide in cash, the remainder of your tour fee, minus the deposit. As an example: 2 people have reserved a basic tour package which costs 145 €, they have paid a 35 € deposit and on the day of the tour, they would pay the guide 110 €. If they would tour an additional hour, they would pay the guide 165 €. Please fill in all of the required fields on our request form below, and we will write back to you as soon as possible, with instructions on how to confirm your booking, how to pay your deposit, where we will meet you, and answer any questions you might have. It is very important that we have your complete flight details, airline, flight #, arrival time and departure time, as this lets us see how long of a layover you will have. If you are flying to Frankfurt from N. America or S. America, remember that you will land a day later than your departure date. We answer all tour requests within 24 hours, so if you have not heard from us, it may mean one of 2 things. Our email to you may be in your spam/junk folder, or there may have been a typo mistake on your email address. Please check your folders, or write to us again and let us know. This has occurred several times recently and it was not possible to get in touch with the requester. Number of people on your tour? Arriving airline, flight number and time? Departing airline, flight number and time? Any special interests or requirements? Have you read our Rates & Conditions yet?